Many scheduling systems use fair-share or proportional-fair-share algorithms (Kay and Lauder 1988). 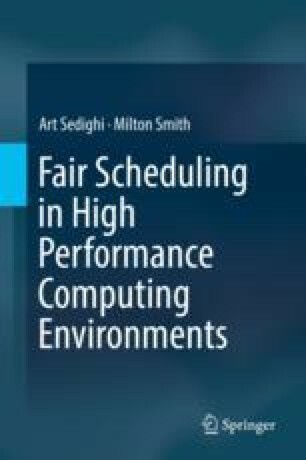 Fair-share schedulers were initially designed to manage the time allocations of processors in uniprocessor systems with workloads consisting of long-running, computer-bound processes (Kleban and Clearwater 2003). Each user was assigned a time slot on a machine (i.e. a mainframe), and in this time slot, the user’s job was the highest priority. If there were any other jobs, they were stopped and restarted at a later time.